You must be a member of the Frankfurt Over 40s Group to attend this activity. Would you like to join this group? I would like to invite you to join me for drinks at this traditional wine tavern in the centre of Frankfurt. The vaulted cellars date back to Protected content were used to store wine up until Protected content . 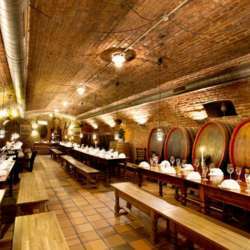 In Protected content was converted to a wine tavern and restaurant, and offers a range of wines from local producers in the Rheingau as well as other parts of Germany and around the world. The restaurant mainly offers traditional fare and is popular with visitors to the Frankfurt Fair.